Published on Chartmill with kind permission of TRADERS’ Magazine. in order to be successful. This article series aims at exposing the underlying forces driving market dynamics while detaching them from their protruding visible consequences that are way better known to traders. » In this article we focus on price gravitation as one of the most important drivers of market dynamics and how this force accounts for asymmetric volatility, market cycles and lots more. Next to that there’s a capacitive force in equity markets we’re going to examine. In these articles we mainly focus on cash and equity markets, characterised by a relative stable free float (number of existing shares in a market) and semi zero-sum effects (semi, because of trading costs). So we steer away from contract markets such as options and futures markets where the number of contracts or open interest, as it is often called, is far from being constant. logic from some basic axioms. A quote is the result of a transaction. It is the price at which the last traded shares changed hands. The place at which an ask met a bid or the other way around. Suppose that a trader, let’s call him trader S(eller), originally bought 100 shares of stock for, let’s say, ten a share, totaling a sum of 1000 paid. Now, for a higher price to make it to the tape, some other trader B(uyer) will have to meet that new (higher) price, implying trader B will have to come up with more money. If the price jumps to 1100 because of that transaction, than trader B has paid 100 more than what trader S paid. trader B bought for 1100 (where he had to come up with the money), he can get rid of for 900 without any money constraint withholding him from doing this. So higher prices need more money, while lower prices don’t. Meet price gravity in the markets in its purest form. True, some of that money may be on margin, but nevertheless, it is money reserved. To the seller, who gets the money, it’s irrelevant if it came from cash or loan on the buyer’s side. Bottom line, it’s easier for prices to go down than to go up. That doesn’t mean prices go down more than they go up. But on average it will take them longer to go up than to go down. It’s like a rock having to be rolled up a hill slowly. But once up there, it can be thrown off the cliff with the simple push of a finger. Secondly, price gravitation might well be part of the explanation why there’s a proven volatility asymmetry. 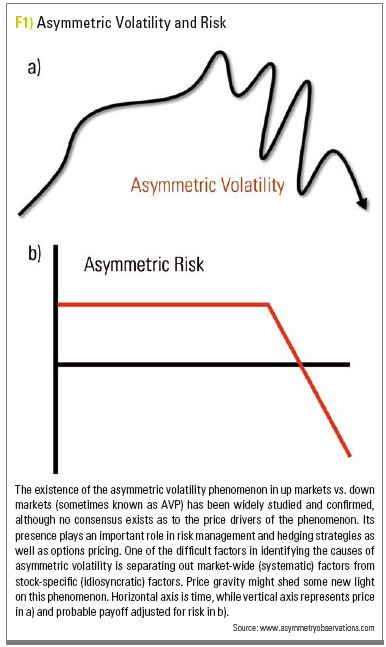 can probably see (Figure 1b) how we can relate this to asymmetric risk: Downside risk is higher than upside reward. that happened was that 200 was extracted from that market. This brings us to the existence of a money flux. Sometimes money flows net into markets, at other times the flux is reversed and the net money flow is pointed outwards from the markets. This brings us to the next physical law in equity/cash markets. (apart from capital operations), a simple axiom holds the basis of a conservational law in the markets we’ll address as emotional capacity. so from/to another (to-be) owner. In this regard, shares normally aren’t exchanged with the company they are representing. So much for ethical and ecological investments. Those companies aren’t even involved (except again during capital operations). lowest price was set on April 19th of 2013. 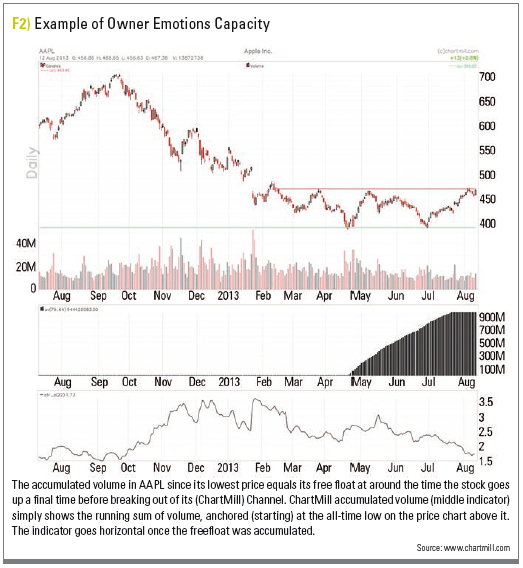 At that exact moment in time, no shareholder on this chart/time frame has a profit on his Apple (AAPL) stock (note that more than the total free float accumulated in volume on the chart before it hit rock bottom). For if that were true it would have need to be bought at a lower price. Which in turn is impossible because of the lowest price being set at that day. So every single share of AAPL stock was in the hands of an owner seeing it representing a loss in his/her portfolio. Now as time passes, shares were changing hands without a new lower price being hit. In this process, shares went from hands of owners holding it for a loss into the hands of owners never having witnessed the downtrend up to the lowest price. Fast forward to mid-June, where the total free float had passed the counter since the lowest price. That was the earliest time at which all owners could have been people not ever having witnessed the downtrend leading up to the April low. And indeed the stock took off to meet his horizontal channel a last time, before breaking out of it. So we don’t know it will trust through, but if it does (as it did), we have a low risk high probability setup. the right side of the chart. resistance. These only work up to the point of accumulated volume relevance and perhaps some self-fulfilling prophecy effect. Dirk Vandycke has been actively and independently dirk@monest.net studying the markets since 1995 with a focus on technical analysis, market dynamics and behavioural finance. He writes articles on a regular basis and develops software partly available at his co-owned website www.chartmill.com. He teaches software development and statistics at a Belgian University.